HS-2100V is a portable, High-Resolution, black and white ultrasound imaging system incorporating the latest technologies available into an economical, user-friendly package. High Density, Multi-Frequency Transducers provide excellent image quality in rugged field conditions or at the office. Moving Image (Clip) Storage and Split Screen Zoom Search allow easier image review and improve diagnostic efficiencies. Multi-Frequency Imaging allows more procedures to be performed with each transducer. This increases user efficiency and lowers overall equipment cost. Legendary Honda Electronics reliability and quality also contribute to a lower lifetime equipment operating cost. 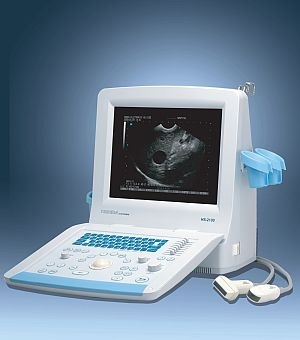 Honda HS-2100V Portable Linear/Convex Ultrasound System, the NEW standard for Image Quality and User Efficiency in all Large, Small and Mixed Animal Veterinary Ultrasound procedures. - Weight: 11 KG approx.